Cedar is an “American Labrador,” or commonly known as a field lab. She came all the way from Milwaukee, Wisconsin to Santa Barbara in June of 2005. 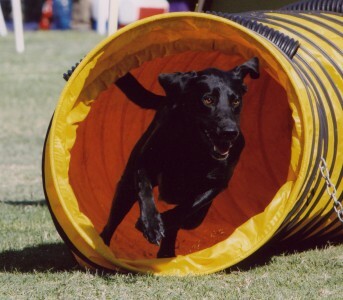 In December of 2006, she started competing in agility and is taking to it like she was born for it! She loves to work, learn and play. Did I say she’s fast? She’s giving Barbara a real run for her money! Time to get on top of those back crosses! Cedar is very sweet natured and a joy to live with, except when arriving at the beach when she just about comes unglued with excitement! She recently acquired a baby sister, Clover, who is the best present mom every brought home!